Year after year, in report after report, we're told again and again, individuals with a college degree experience lower unemployment rates and higher earnings than individuals without a higher education. But is this still true? Many people wonder if the cost of attaining a higher education is still worth the investment, especially today—given the rising costs of higher education. According to recent 2013 data, from the U.S. Bureau of Labor Statistics (BLS), getting an education is still worth every penny. The numbers don't lie and the proof is in the statistics. The chart below (representing data from the Current Population Survey published by the BLS) shows that for every additional level of education a person attains, their chances of being unemployed drop dramatically. 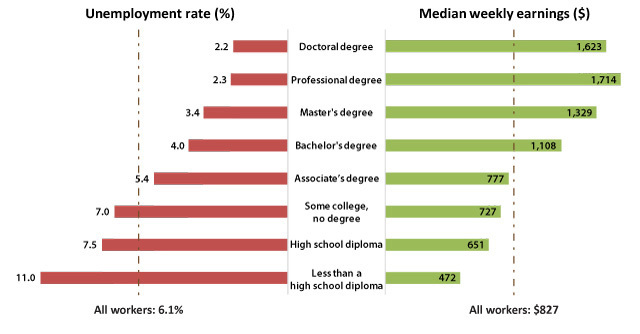 Not suprisingly, workers who don't even have a high school diploma have the highest rate of unemployment, while those who have a doctorate degree experience the lowest rates of unemployment. Earnings also increase as level of education increases, with one exception. Earnings peak for workers who have obtained a professional degree —doctors, lawyers, dentists, etc.—but decline slightly for those with a doctorate degree. The earnings shown in the chart above are based on median salaries; where half of workers represented per education level earn more than the amount shown, and half earn less. However, it's important to know that earning an advanced degree or higher education does not guarantee a successful career. How much a worker earns is determined by a number of factors in addition to education level, such as occupation, level of experience, and geographic location. Before you jump in to an education program, you'll want to determine which careers are a good match for your skills, interests and long-term personal and financial goals—taking into account the factors below. The geographic location where you choose to work will be one of the largest factors influencing how much you will earn. For example, a corrections officer in Mississippi will earn about $28,000 a year. That same corrections officer will earn over $60,000 if employed in California—over double what he'd earn in Mississippi. Salaries for professionals employed in larger cities, such as San Francisco, New York, and Chicago, are typically much higher than salaries for workers employed in rural areas like Lincoln, Nebraska or Logan, Utah. However, the cost of living in big cities is also much higher than it is for more rural towns. At the end of the day, what you can accomplish as a professional is going to be one of the biggest factors influencing how much you'll earn. A skilled trial lawyer, that knows how to win cases for his or her clients, is always going to earn more than an inexperienced lawyer who doesn't have the same level of skill. Another benefit of experience is your reputation. Typically, the more experience you gain, the better your reputation will be. As your reputation increases, so will the amount that others are willing to pay for your services. A good reputation, built on years of experience, will be one of the greatest assets you can develop, if earning more is your goal. It's pretty obvious that a janitor isn't going to earn as much as an attorney—even if he has a master's degree in facility management. If earning a large salary is one of your objectives, you'll want to find an occupation that offers high earning potential. Even within a specific industry, earning potential can vary greatly by occupation or specialty. For example, an attorney working in corporate law will typically make more than an attorney working as a public prosecutor for the state. Explore your career options carefully if you're sensitive to how much money you'll make down the road. Statistically, level of education is a good indicator of future earnings. On average, as a worker's level of education increases, so does his or hear earning potential. Workers with a high school diploma typically earn more than those without a high school diploma. Those with a 4-year bachelor's degree earn more than those with a 2-year associate's degree. Professionals with a master's degree or professional degree earn more than those with a bachelor's degree. Earning an advanced degree will not only increase your earning potential, it will open up the door to more career prospects and opportunities.